Tamron have long held a strong reputation in the macro lens arena, offering lenses that compete well in terms of optical performance when compared to camera manufacturer’s own offerings. Even ‘brand fanatics’ have been won over by Tamron’s macro lenses, so a new lens that incorporates several advances in lens technology is something to pay attention to. With a specification list that reads very much like the Canon EF100mm f/2.8L Macro IS USM lens, could this model from Canon mount version from Tamron really be a credible. With a DxOMark score of 23, this new model actually falls behind its older sibling, the Tamron SP AF 90mm f/2.8 Di Macro, which scored 25. In terms of the P-Mpix score, mounted to an EOS 5D Mark II, it managed 13P-Mpix, relative to the nominal score of the camera being 21megapixels. While this may sound quite low, the sharpness is almost completely homogenous across the frame with hardly any fall-off all the way out to the edges, even when shooting at the maximum aperture. Looking at the Chromatic Aberration scores, the lens performs very well with hardly any chromatic aberration that would be visible in final image. Again, this holds true at all apertures as well, so you should not expect to see much fringing around any high contrast edges – for example around the edges of hair on insects. The distortion is also well controlled, showing no real barrel or pincushion distortion. Though with prime lenses such as this, it this is to be expected as it is easier to control this aspect of lens design when free of the compromises caused by a zoom lens. The lens shading, or vignetting, is the only real area of concern on this lens, as when shooting wide open at f/2.8, there is up to 1.5EV difference between the centre and edge of the frame. Since macro lenses are often used wide open, this may be a concern, though as soon as the lens is stopped down the vignetting does improve and by f/5.6 it has disappeared completely. Before we look at specific comparisons, it is worth studying the range of macro lenses currently tested in the labs on an EOS 5D Mark II. As of today, there are 7 lenses in this group. While the test results for this new lens may seem disappointing in isolation, there is only a 6point difference in DxOMark scores between the very best (Carl Zeiss Makro-Planar T 100mm f/2 ZE Canon scoring 28) and the very worst (Canon EF100mm f/2.8 Macro USM scoring 22). Although this lens is only one up from the bottom in terms of DxOMark score, the price of this lens ($460USD) compared to the Carl Zeiss lens ($1,840USD) makes it seem like a good purchase since the real-world difference in optical performance is not as great as the price difference. Comparing this latest version of the Tamron 90mm Macro lens, with its predecessor, we can see that in actual fact, in all lab-test areas with the exception of chromatic aberration, the older version matches or outperforms the new version. However, they are very close – sharpness scores of 13P-Mpix for the new version and 14P-Mpix for the older version are close enough that in the real world there is no obviously discernible difference at normal print sizes. It is only the chromatic aberration score that is better on the new version than the old, scoring 5µm to the older lens’ 9µm – a difference that will be visible in final images. So why would you choose the new lens over the older model? The answer lies in features beyond those tested in lab conditions – this lens includes both Tamron’s Vibration Compensation system and an ultrasonic motor. It is possible that the VC system is responsible for the lower sharpness than expected, as often non-stabilized lenses perform better than stabilized versions. However, the stabilizer offers extra benefits in terms of shooting by allowing sharp images are slower shutter speeds. The ultrasonic motor combined with an internal focusing system is another big plus in terms of handling and real-world use for the new lens. Instead of slowly moving through the lens range, the USD focus motor promises smooth and fast focusing. Combined with internal focusing, the handling of the lens is much improved because the lens length and balance does not change during focusing. Choosing between these two Tamron lenses will come down to how important the Vibration Compensation and Ultrasonic Drive AF is to you. If you already have the older model, then upgrading will not gain you any optical performance, but you will find the handling improved. If you are looking to buy and don’t yet have the previous model, then the choice will be driven by price and features more than performance. In terms of transmission scores there is very little to choose between them, all three models performing around the same level. It’s the same for the distortion scores and the vignetting scores, with all three lenses showing essentially no distortion and equal amounts of vignetting when shooting wide open. Finally, the chromatic aberration scores show a chink in the Canon armor, with it coming last with 11μm, while the Sigma and Tamron lenses are matched on 5μm. If price is not an option, then the Canon lens is clearly the best of these three options. However, it is also the most expensive. The Sigma falls somewhere in the middle and the Tamron is a little behind. However, while the figures may suggest the differences are large, in the real world, they are quite minimal and are unlikely to be anything to worry about unduly. Given the $250USD saving of the Tamron over the Sigma lens, it does actually still make a very good macro lens choice. Before making a buying decision, you need to work out if a macro lens is for you. Clearly if you want to shoot macro images, the answer is yes, but how about if macro is not at the top of your list? Well, macro lenses are actually some of the most versatile around, especially when they fall around the 90mm focal length, because they make very good portrait lenses that are sharp and offer a fast maximum aperture to help achieve a shallow depth of field. Many models now also include some form of image stabilization as well making them great in hand-held low light shooting. If you are looking for a macro lens and price is not a major concern, then the Canon lens is clearly the best of these three options. However, it is also the most expensive. 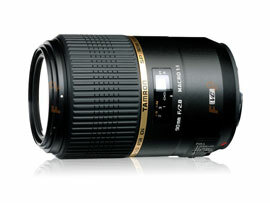 The Sigma falls in the middle in terms of performance and the Tamron is a little behind that. However, while the test figures may suggest the differences are large, in the real world they are quite minimal and the differences in optical performance are unlikely to highly obvious in your final images. Given the $250USD saving of the Tamron over the Sigma lens, this addition to the Tamron range does still make a very good choice and is more than capable of performing alongside other lenses in this category.